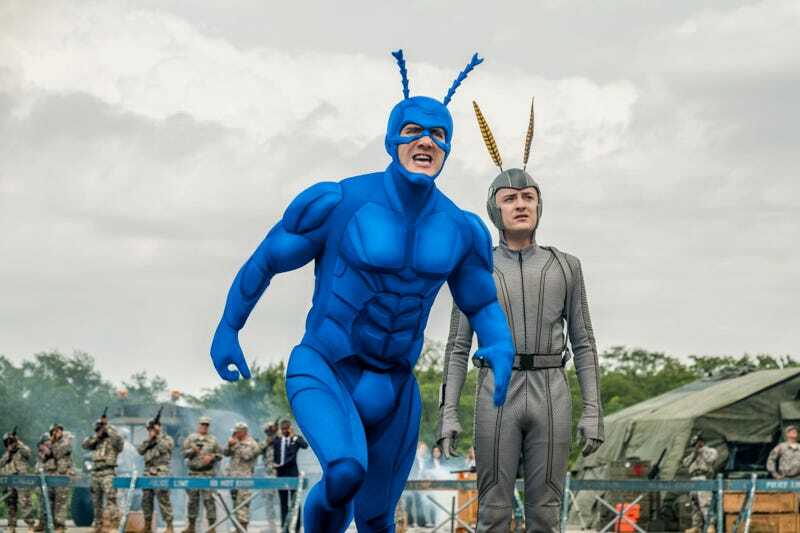 The last episode of The Tick’s first season wastes no time getting to the big question: can Arthur successfully shrink the VLM down to normal size, or will he explode anyway? If we’re being honest, there probably wasn’t that much drama here. We didn’t know for sure if things would go exactly as planned, but we could be pretty sure the main character wouldn’t die. That didn’t make the action any less suspenseful, though, particularly when Superian showing up threatens to spoil Arthur’s plan. Ultimately, things work out; the VLM shrinks, and while Superian has a “Bismuth hangover,” he’s no worse for wear, and the city is saved. But while Terror’s initial plan is foiled, he would never go down that easy. As it turns out, the T from his cola company building doubles as a ship, and he flies into town hoping to get his message out. Arthur and Tick find out and track him down, but his real undoing comes when Lint escapes without him, making him a sitting duck. The tension between Lint and Terror had played out in a subtle way. Unlike Ramses, Terror at least partially appreciated what Lint could do, but he could never quite grasp exactly how essential she was to the plan. Now, she escapes, and we’re left to wonder how she’ll be used next season. She’s arguably the most interesting character on the show, and she has reason to target The Terror, as well as Tick and Arthur, not to mention her past romance with Overkill. There’s quite a few directions the show could take things with her. As for Arthur, despite saving the day, and stopping both of The Terror’s plans, he still winds up on the wrong end of a shotgun. At the exact moment that Terror is contemplating whether or not to kill him just for the hell of it, Superian arrives and freezes him, becoming the hero of the day even though Arthur and Tick has done far more. The real show, though, comes when Arthur finally expresses his rage at the Terror; as he points out, despite his firm belief that everything he does is planned and structured, he basically makes things up as he goes along (did he just watch Whiplash one night and decide he wanted to make jazz drumming part of his thing?). The eccentricity that makes The Terror such a fascinating villain ultimately lead to his downfall. The last few episodes have long been hinting at Arthur repairing his relationship with Walter, and sure enough, they come together here. One of the best scenes involves the pair taking down a group of The Terror’s minions together, and as much as Arthur has been trying to understand where Walter is coming from, Walter is now reciprocating. He realizes that Arthur’s failures in life prior to meeting Tick came primarily because of how low everyone’s expectations were. they basically all saw him as this poor, helpless sap, and that’s what he became. Tick’s encouragement of him may have been confusing at times, but it’s the best thing that ever happened to him. Now, the entire family knows what he’s capable of, and the respect he gets is well-earned. Considering how neurotic Arthur was at the beginning (to be fair, he’s still pretty neurotic now), watching him learn to believe in himself was incredibly satisfying. In our final scene, we see an AEGIS drone tracking Arthur and Tick, reminding us that, yes, they’re real heroes now, and with acclaim comes scrutiny. This season, Arthur and Tick were more or less able to work on the fly. Now, their actions will be tracked more, and that could cause them to be more cautious. Seeing how that effects their adventures, and how Arthur responds to being in the public eye will likely be quite interesting to watch going forward. 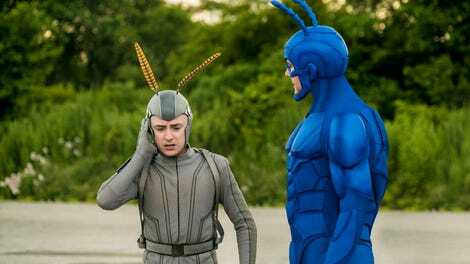 In the meantime, the first season of The Tick should go down as a great success, giving us humor, suspense and character development. It has proven itself to be a more than worthy adaptation of one of the most beloved cult superheroes. -The Terror really has some great lines here. I’m particularly partial to “SHAKE IT LIKE A BABY,” and ”Proud of yourself, you little of cup of piss? -”Powerful words...I’m assuming” is Tick’s response to Uncle Samson’s words on the Flag five Memorial, which he plagiarized anyway. -”This little Piggy’s not going to market!” says Tick after he punches the VLM in his giant big toe. -While the story is mostly about Arthur coming of age, Dot should get some points for telling him to shut up when he warns her not to infiltrate anymore. Between her and Miss Lint, the show has a subtle feminist message, as both are doubted by their male counterparts despite proving themselves multiple times. -Between how aloof Superian is, and how much credit he got for what was mostly Tick and Arthur’s work, I have to wonder if maybe he kinda lucked his way into being the world’s biggest superhero, and is kind of just in the right place at the right time a lot. I really hope future seasons explore this possibility.